Have you ever tried to sync your iPhone with a new computer and found that it didn’t work? Worse still, did you have all of your data deleted from your iPhone just because you were trying to add music to iPhone from computer? No worry! These limits can be overcome here. Plug in your iPhone 7 with its original cable. Once the files are on your library, then click on the name of your device in iTunes. Click the “Music” tab from left sidebar. Tick “Sync Music” and check the entire music library or some selected songs. Hit “Sync” button once done. This method is fine to use, but it does have its limitations. For instance, you can lose previous music that you didn’t purchase if you try to sync this way. Also, you can have trouble syncing music in formats that iTunes doesn’t recognize, and you may have to convert them first. What’s more, if it is the first time you sync your iPhone 7 to this computer or your iPhone 7 has been synced to another iTunes library, not only music, but also movies, playlists, TV shows and more will be erased. There are also a couple of ways that you can do this without iTunes at all. 1 Using Professional iPhone Transfer tool - All Music Formats Supported! iMyFone TunesMate is the answer to all of your frustrations with iTunes. Like iTunes, it can help you manage and transfer your files, but it allows you a lot more freedom. You can import music to your iPhone 7 either individually or in bulk, and you can transfer back and forth between your iPhone and your computer. Previous music on your iPhone 7 will not be deleted while transferring. You will not face the issue that music cannot be played on iPhone after transferring. 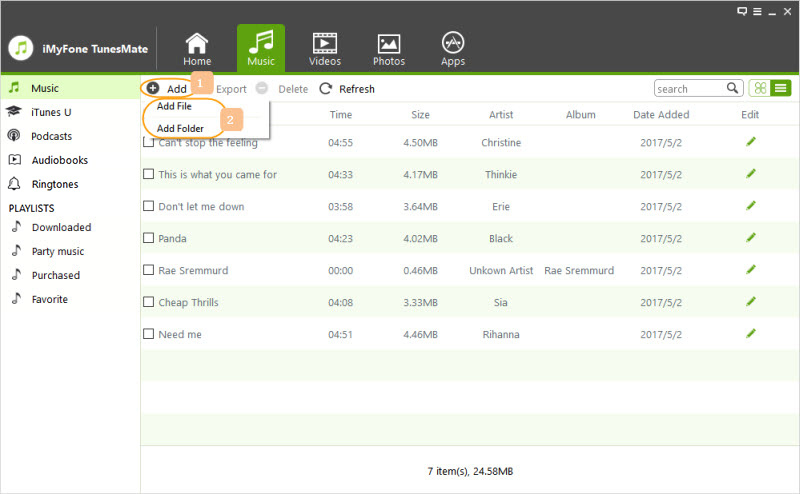 It supports free or paid music files. Step 1: Install iMyFone TunesMate on your computer. Plug in your iPhone 7. Step 2: Go to the “Music” tab and you will be in the “Music” window. You should see your music files populating the screen. Now your selected files should be added to your iPhone. It really is as simple as that. Note that when you try to upload music to your iPhone in a format that is not supported, TunesMate will convert the music format to one that is supported by iPhone. This is very convenient. You don’t need to use music converter first. In addition to being able to add music files from your computer to iPhone, TunesMate can help you manage your music in other ways. It helps you to put all your music from different devices into the same iTunes library, which means you can share music with friends. 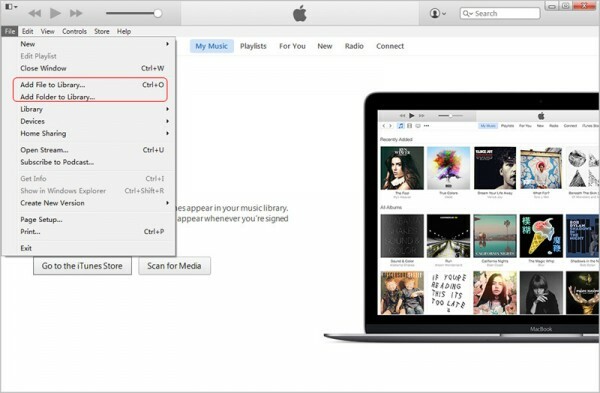 It can back up your iPhone music to your computer. It allows you to edit your music info. It can help you manage your music playlists—for example, you can delete playlists, rename them, create them, or add music to your playlists. In addition to the above methods, you can also use available cloud services to download music to your iPhone 7 from your computer, though it takes a few more steps. You just need to upload the music to the account from desktop application and then download them from the corresponding app on iPhone 7. You can use any one of these services. Amazon Cloud Player lets you listen to new music as it comes out, and has extra features like the ability to play lyrics on the screen as you listen. You can also make playlists of your songs with it, which means that you can ultimately transfer music from your external devices to your iPhone. You can upload 250 songs for free or pay $24.99 per year to upload up to 250000 songs. Google Play Music allows you to create playlists of songs, listen online and offline, and watch Youtube videos. You can also transfer music around in a limited way. This app is available for free to upload 20000 songs. If you need more, pay $10 per month. You can transfer any kind of file with this, and it’s an extremely popular cloud service. You can simply install it on your iPhone 7, install it on your computer (or simply use the web app), and you can transfer your music via the cloud easily. But please note that, you need to convert music format first if they are not the supported ones. Or added music cannot be played on your iPhone 7.